In one government facility for immigrant youths, a 20-year-old woman who had lied that she was 17 sneaked a needle out of a sewing class and used it to cut herself. 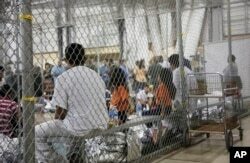 FILE - People who've been taken into custody related to cases of illegal entry into the United States, sit in one of the cages at a facility in McAllen, Texas, June 17, 2018. Records obtained by The Associated Press highlight some of the problems that plague government facilities for immigrant youths. Records obtained by The Associated Press highlight some of the problems that plague government facilities for immigrant youths at a time when President Donald Trump’s administration has been making moves in recent weeks that could send even more migrant children into detention. About 14,000 immigrant children are detained in more than 100 facilities nationally, with about 5,900 in Texas. Many crossed the border without their parents and are having to wait longer in detention to be placed with relatives or sponsors, who are being dissuaded to come forward out of fear they’ll be arrested and deported. But as records obtained by the AP show, the child detention system is overtaxed. Children are acting out, sometimes hitting each other and trying to escape, and staff members struggle to deal with escalating problems. 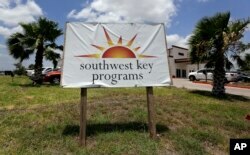 FILE- Southwest Key-Nueva Esperanza, in Brownsville, Texas, shelters unaccompanied immigrant children, June 20, 2018. FILE- Immigrant children play outside a former Job Corps site that now houses them in Homestead, Fla., June 18, 2018. In each case, inspectors interviewed other minors detained at the facility. According to the reports, the other youths said they were treated well, had enough food, and felt respected by the staff. Jeff Eller, a spokesman for Southwest Key, acknowledged that staff morale has suffered this year because of the unprecedented demands.